How much water do you use every day? 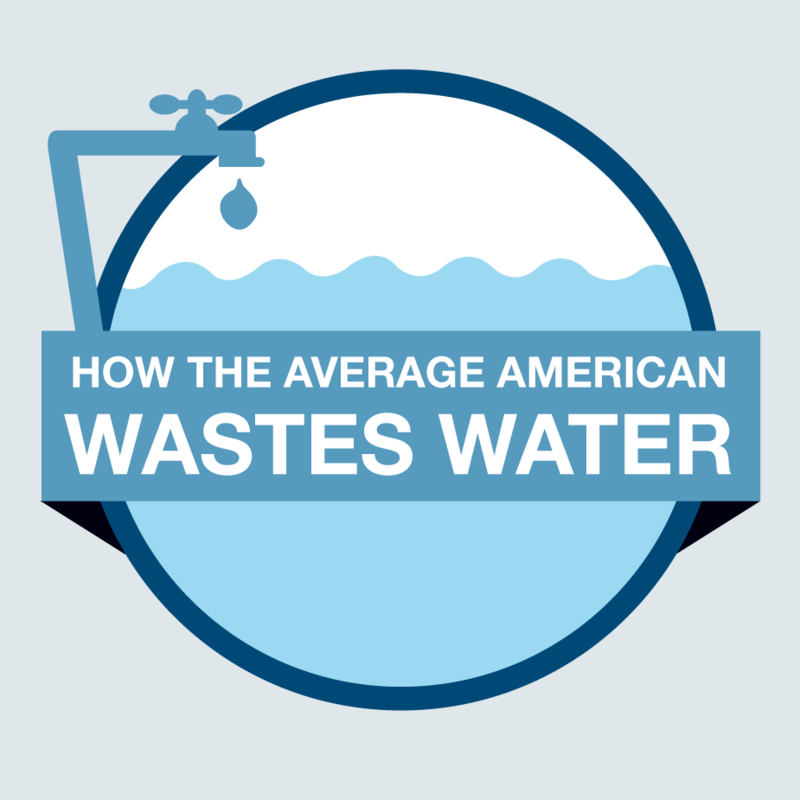 Most of us have no idea, and this infographic reveals how the average American wastes water and ways to change your H2O habits. Water, water, everywhere… If you’re like most people, you probably never think about the amount of water you use every day. It’s not like money that you can earn, borrow, or loan to your kids – just turn on a tap and it flows. From brushing your teeth in the morning, to that elegant fountain downtown, water is a resource that is largely taken for granted. However, when you see how much we use, and waste, you may be surprised. No, a water footprint is not the footprint you leave when you run around the pool, it’s actually the total amount of water used in the country. And this number is expressed in cubic meters (1 cubic meter is 264.172 gallons). 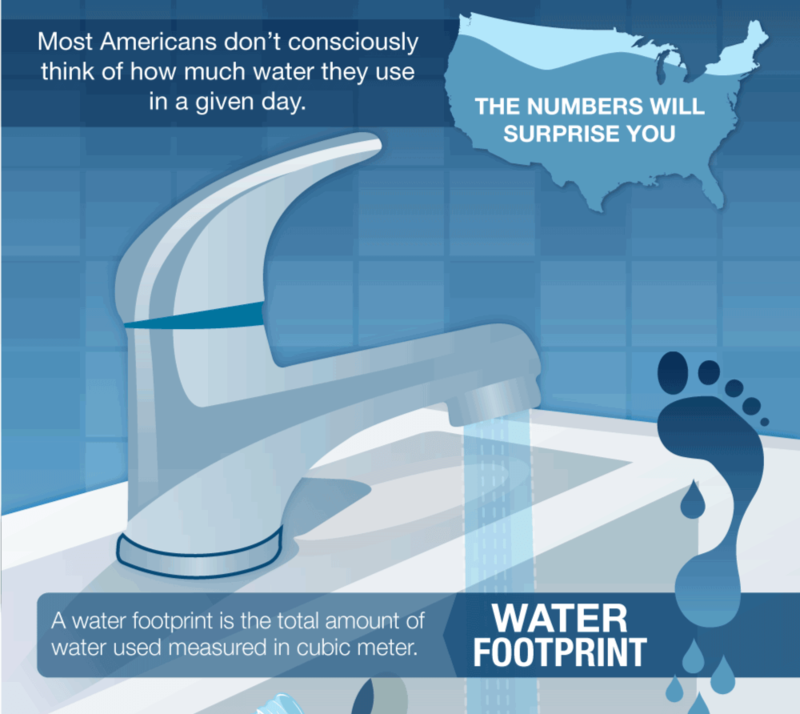 According to Scientific American, America’s water footprint measures in at 1.053 billion cubic meters per year (that’s 278,173,171,133.1 gallons). Yes, China and India use more water generally, but we are close to their overall usage with a much smaller population than either of these countries. 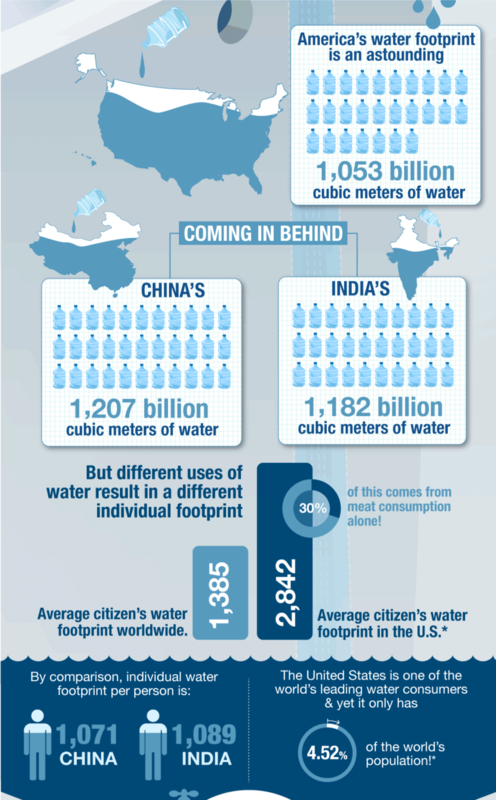 As individual Americans, we use more water per person than anyone else on the planet. How Do We Use So Much Water? Easy. Keeping our lawns growing, filling swimming pools, not fixing leaky pipes, you name it. And the biggest water drain? 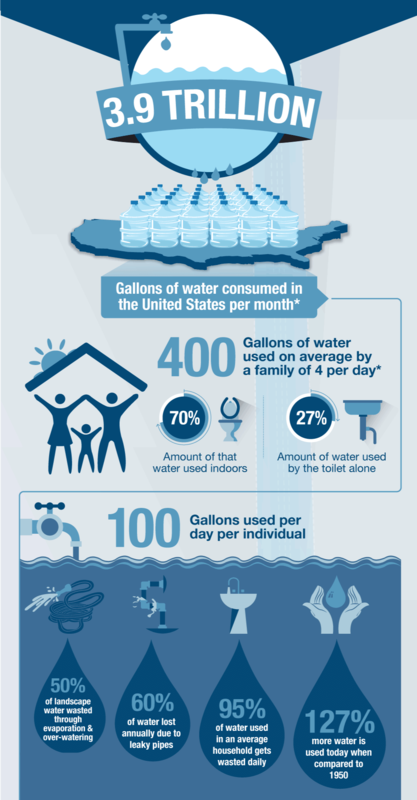 The EPA estimates that 27% of our indoor water usage comes from the toilet. This number is even higher for older bathrooms. Surprisingly, making water more expensive doesn’t seem to help. Even if you have to borrow money from your aunt to pay the water bill, chances are you will still use a lot. What can help? Step one is understanding how much water is wasted every day. Try some of these changes for yourself. Over the year you could save thousands of dollars for yourself, and help insurance that there is enough water for future generations. What about water? It is easy to take this basic building block of life for granted. However, water is a surprisingly limited commodity. Over the next 30 years, the global water supply is in danger of drying up. The world population is projected to reach nine billion by 2050. Not only will these people need water to drink and bathe with also a massive amount of water must be used to grow additional food. The most rapid growth will be in developing nations, whose water supplies are already under stress. By 2030, the number of people living under severe water stress is expected to rise to 3.9 billion, nearly half of the world population. The annual personal water use by country varies widely. In Canada, 88 percent of people have access to tap water. Canadians use 759 liters per day. In the USA, 100 percent of the people have access to tap water, using 570 liters of water per day. In Mexico, 90 percent of the people have access to tap water, with each person using 340 liters of water per day. In India, 19 percent of the people have access to tap water, with each person using 128 liters of water per day. In the U.K., 100 percent of the people have access to tap water, using 119 liters of water per day. In China, 69 percent of the people have access to tap water, with each person using 80 liters of water per day. How Does Your Country Utilize Water? Because of water-saving farming techniques and better infrastructure, the developed world uses less water to grow more food. If the developing world can receive assistance modernizing their agriculture techniques, they can produce more food and have more water left over to meet other needs. China uses about 60 percent of its water on agriculture, about 30 percent of its water on industry and about 10 percent on domestic uses. India uses about 70 percent of its water on agriculture, about 10 percent of its water on industry and about 20 percent on domestic uses. In the U.K., about 5 percent of the water is used on agriculture, about 65 percent of the water is used on industry and about 30 percent of the water is used on domestic uses. In Canada, about 10 percent of the water is used on agriculture, about 60 percent of the water is used on industry and about 30 percent is used on domestic uses. In the U.S.A., about 50 percent of the water is used on agriculture, about 40 percent of the water is used on industrial uses and about 10 percent of the water is used on domestic uses. In Mexico, about 80 percent of the water is used in agriculture, about 10 percent is used in industry and about 10 percent is used for domestic purposes.